It looks like Marvel has just released a Marvel Comics REST API which allows developers to access the entire Marvel Comics Universe and build custom applications and websites with that data. So, you might be wondering what does this have to do with VMware and virtualization? 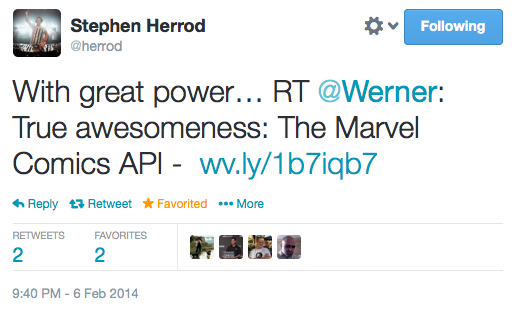 Well, when I heard about this API, I knew I had to find a way to incorporate this into a cool VMware project. I decided to create a sample vSphere SDK for Python (also known as pyvmomi) script that would allow a user to specify a number of random Marvel Characters to select from the Marvel database and then automatically create dummy VMs based on those names which could be used for testing. There were a variety of VMware SDK's (Perl, Ruby, PowerCLI, Java, etc) that I could have used, but I opted for the vSphere SDK for Python given my Python skills were not very strong. This also gave me a good reason to play around with our Python SDK. Install vSphere SDK for Python, you can take a look here. Disclaimer: There is not much error handling built into the sample script, please use at your own risk. You will need to edit the script and replace the following two variables: marvel_public_key & marvel_private_key with the API key after creating an account on Marvel's website. One thing I really like about the Marvel API and I know many other vendors also provide this which is an interactive API tester. This allows a user to explore and execute a particular API requests without writing a single line of code to get a better understanding of the results before one starts to develop their application. As you can see from the screenshot above I have just created 10 random VMs where each name is a random Marvel character extracted using a GET request on /v1/public/characters. 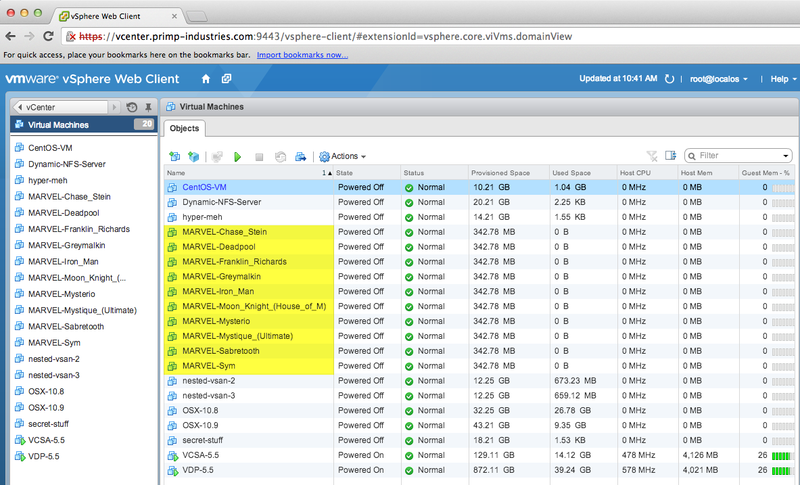 If we head over to our vSphere Web Client, we should now see our 10 newly created VMs which contain 1vCPU and 128MB of memory. To keep things simple, I did not add a vDisk but you can easily tweak the dummy VM configuration based on your requirements. This is an awesome post. Learned a lot. Would it be possible to extend it to launch a ovf file as a VM? Your help is much appreciated.